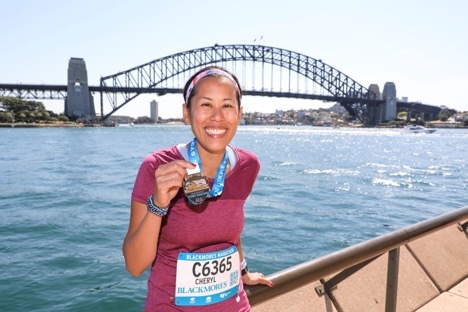 Cheryl Hile at the Sydney marathon. She ran seven marathons on seven continents in a year. Impressed? She also has multiple sclerosis (MS). Cheryl Hile, 43, of Pacific Grove, California, has pounded the pavement in Capetown, South Africa; Buenos Aires, Argentina; Honolulu; the White Continents Marathon on King George Island in Antarctica; Tokyo, Japan; Vienna, Austria; Sydney, Australia and — It's considered by some geologists to be the "eighth continent," Zealandia — Christchurch, New Zealand. So that actually makes eight marathons! 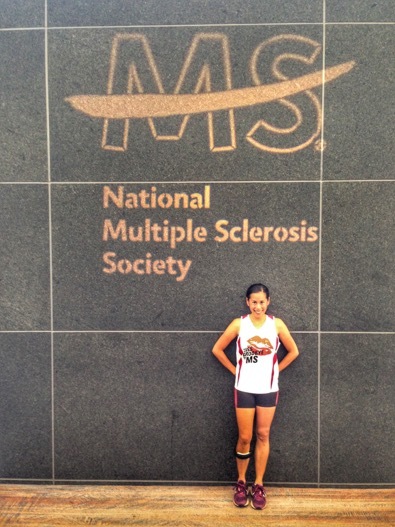 In all, Cheryl has run 57 marathons, including 44 with MS, and she isn’t done yet. We talked with her by phone to ask how she has managed to accomplish so much. HealthCentral: Cheryl, it feels like we are talking to a superwoman here. Where do you get your resolve? Cheryl: It may surprise you, but sometimes it makes me cry because I am so hard on myself, always trying to be perfect. I am the type of person who blames myself for getting MS. And get this: My husband and I got married in June 2005 and I was diagnosed in October 2006. I said to him: "Sorry, but the one-year warranty is up and you still have to keep me." Not being perfect was very hard when I was still working as an accountant at UC San Diego, where I'd been for 17 years. I managed multi-million-dollar contracts and grants for the department of computer science. I worked full time with MS for almost 10 years, went part time in January 2015, then left completely in August 2017. MS fatigue started to cause me to make stupid mistakes I'd never made before. I got so overwhelmed with the workload that my wonderful co-workers started to cover for me, but the faculty knew something was wrong. Everyone said to "take your time," but it wasn't right for me to stay in a job like that. I'm not working at all now and we just moved. I'm not sure which direction to go, but I would like to do more public speaking. I've spoken a few times, including for the MS Society, and loved it. Cheryl Hile, proud speaker of the MS Society. HealthCentral: Walk us — or in your case, maybe run us — through the history of your illness. Cheryl: As I said, I was diagnosed at 32, in 2006. My symptoms started in January, like electric shocks in my right arm. My doctor thought it was a sports injury and wrapped that arm in an ace bandage for two weeks, but I also had really bad itchiness and numbness. I returned to my doctor, and he gave me gabapentin to relieve nerve pain. I got worse overall, and in October, I had an MRI (magnetic resonance image) that showed lesions. I'd already run 13 marathons before I was diagnosed. I had started tripping and falling and I'd thought I was injured or just over-training. When I developed foot drop, my neurologist told me to lower my expectations. I knew I would keep running because it was just the ticket to elevate my mood, and made me feel better about myself. At the Hanger Clinic in Encinitas, orthotist Ara Mirzaian fitted me with an ankle foot orthosis made with carbon fibers, to counter the foot drop and ensure I land on my heel and don't trip over my own foot when I run. I've used it since 2008. HealthCentral: So what can you share about your self-care, your medications, and lifestyle choices? Cheryl: I have been on Tecfidera, dimethyl fumarate, since July 2015, and I started right away. I try to take as few medications for pain as possible, and acupuncture really does help. I am a vegetarian, since I believe meat may not help this condition. (Note: The proposed diets for MS are mostly plant-based.) I can't be vegan because I love cheese and yogurt, but I do drink almond milk. I avoid processed foods in general but love vegetables. I also take fish oil supplements and B-vitamins. I typically exercise first thing in the morning because I get too fatigued later. Oh, and I tried night-time marathons, but those were disastrous. On a typical day, I run three to four miles, more on the weekends, and I'm also big into cycling, and love to ride up and down the coastline. It all helps relieve my stress. 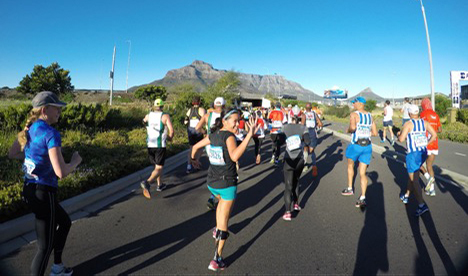 Cheryl Hile at the Cape Town marathon. HealthCentral: You do seem very focused, so determined. Agreed? Cheryl: I am a little crazy, a little stubborn, and I don't want anyone to dictate what I can or can't do. If I need to, I do what I can to make adjustments. When my neurologist gave me my diagnosis, and told me to lower my expectations, my mantra became: "I will do what I can and I will never give up." HealthCentral: You and your hubby, Brian, are quite the pair. You really are in sync. Cheryl: He really is the love of my life, my care partner, my supporter and my cheerleader, all in one. I can't run without him by my side. My right side gets weak when I am overheated, and he's there to open a water bottle, tear open a drink packet, and to serve as my guide and to help me run in a straight line. That's important when all my effort comes from my left side when my right side "drags." 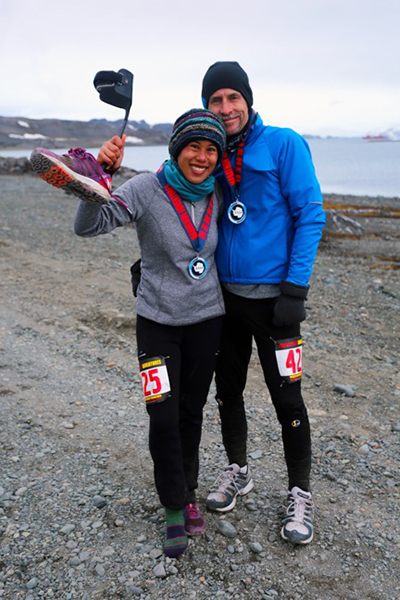 Cheryl Hile and her running partner and husband, Brian. No doubt we'll be seeing Cheryl in more marathons, inspiring more people to run, not walk, to their nearest race event.